Thai Chicken Lettuce Wraps :: Edible Garden Corp. 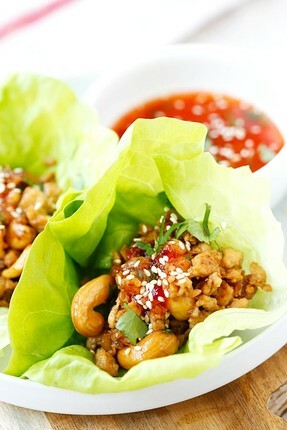 Description: Thai Chicken Lettuce Wraps – easy, healthy and delicious chicken wraps with Thai sweet chili sauce. Takes 20 mins to make you’ll want it every day! Thai Chicken Lettuce Wraps – easy, healthy and delicious chicken wraps with Thai sweet chili sauce. Takes 20 mins to make you’ll want it every day! Mix all the ingredients for the Sauce in a small bowl, stir to combine well. Clean the butter lettuce, peel each leaf off the stem, set aside. Heat up a wok or skillet on medium heat and add the oil. When the oil is heated, add the onion, garlic, and stir-fry until they are slightly browned. Add the ground chicken, stir continuously with the spatula, break up the lumps. Add the cashew nuts, fish sauce, and sweet soy sauce. Stir to combine well. Continue to cook until the filling becomes dry but remains moist. Add the cilantro and turn off the heat. To assemble the lettuce wraps, add 1 tablespoon of the filling onto the middle of the butter lettuce, and top with some sauce. Wrap it up and eat immediately.